No Barriers empowers people to break through barriers, find their inner purpose and contribute their best to the world. 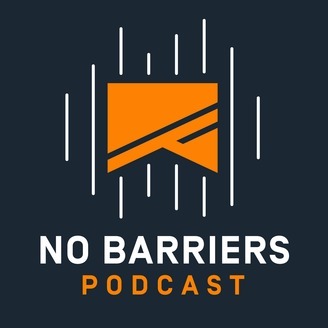 The No Barriers Podcast is an exploration of the gritty reality of the struggles we all face, with the detailed stories of those that have persevered to find amazing outcomes on the other side. 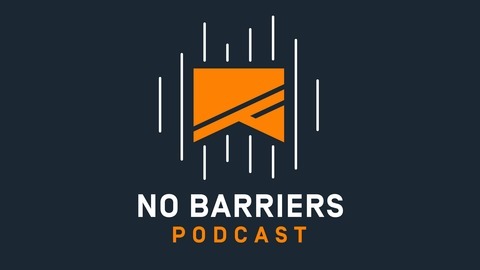 The No Barriers Podcast is a production of No Barriers USA, a not-for profit corporation as designated under Section 501(c)(3) of the Internal Revenue Code. All donations are tax-deductible. To learn more about No Barriers, visit nobarriersusa.org and find out how you can get involved in our programs. Our three hosts sat down with George Basch in our studio. Repeat episode description. For Jeff and Erik it was more of a reunion as they have a climbing history together. They reminisce on their first climb in ‘98 up Aconcagua. In fact, George and Erik met in Phoenix during Erik’s previous life as an English teacher (he taught George’s son!) and he essentially became a mentor and an inspiration when he was looking to make his life in the mountains as an adventurer. Previous to his life as an adventurer, he was a business person. Our hosts dive into George’s past in the business world; including a time when he had to declare bankruptcy. He essentially started over at age 50. Part of his internal ethos (that he inherited from his family) is to go out and DO. To be part of action and make a difference in folk’s lives. He’s active in the American Alpine Club, the Explorers Club, and other organizations. But one constant has been his desire and drive to give back. During one of his many expeditions to Nepal he became fixated on the horrible air quality in the homes he visited due to the traditional stoves they used to cook their food that ran on yak dung and polluted their dwellings. George tells the story of how, in 2009, he came upon a company who was designing more fuel efficient stoves. These new stoves solved so many issues, including lessening the insistence of immune sickness, respiratory problems, and blindness/eye issues. George created a system where stoves are delivered all-over the countryside and within ten minutes of set up the entire living space is transformed. We were lucky enough to see these in person when George brought one into our studio and set it up within no time. Listening to George, it’s clear how he leads a life of purpose and how he seeks meaning. It’s a core component of his identity but it does not mean it’s easy. George discusses how he has gone about facing his own barriers - both in work and in his personal life - but how, ultimately his passion to help others, continues to push him onwards. Photos of George's stoves will be shared on the No Barriers Facebook page. From Swiss Cheese to Whole: Finding Inner Light with Survivor and Artist, Angie Shireman.